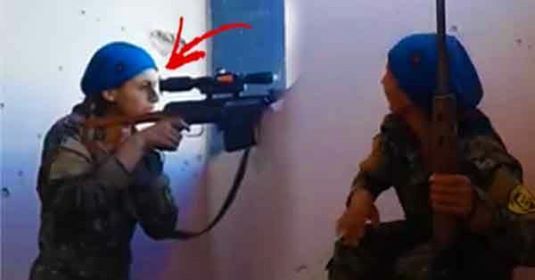 You Won’t Believe What This Female Sniper In Syria Did After She Narrowly Escaped Death! Everybody knows that there is an ongoing civil war in Syria. It has been happening since 2011, when the flames of civil war were sparked by pro-democracy protests. Thousands of Syrian refugees over the years have fled to many different countries seeking respite from the violence. Unfortunately, some are unable to leave Syria, Others choose to stay in the hopes of making a difference. Due to the nature of war, everyone is Syria is at risk of death. From the military personnel, to the civilians, to the volunteer aid workers, these people are under constant threat of a bullet or a bomb. Amidst the suffering, a ray of hope shines through – fearless fighters who fight against the tyrannical forces of ISIS and the Syrian government. Case in point, this female sniper who almost met the grim reaper after an ISIS shooter narrowly missed the shot that was supposed to kill her. Footage of her escaping death is circulating online. It shows the Kurdish female sniper laughing after realizing that she was almost shot dead. The female sniper can be seen aiming at her target. As soon as she fired a shot, a bullet came streaking towards her. It was a close shot – right above her head. She immediately ducked and laughed it off afterwards. She also stuck her tongue out as if she just heard a bad joke. The female sniper is believed to be a part of the YPJ (Women’s Protection Unit) – an all-women, Kurdish military branch of the Kurdish People’s Protection Unit. They defend Syria from attacks perpetrated by ISIS militants, and the Syrian government, as well as the Al-Qaeda terror group. The organization now has more or less 7000 volunteer fighters that range from 18 to 40 years old. Were you shocked by the video? Post your reactions about the laughing female sniper in the comments section.